Mumbai: In a press conference in Mumbai on Tuesday, TAPMI announced the launch of their post-graduate program in Human Resources Management. 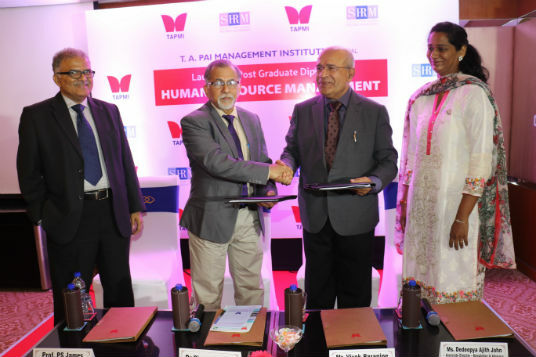 TAPMI is collaborating with SHRM (Society for Human Resources) to develop the curriculum for the program. 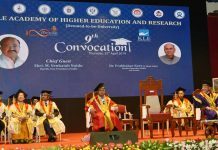 On successful completion students will be awarded PG Diploma in Management (HRM) by TAPMI and will also have the opportunity to take the certificate exam to get SHRM Global Certification, a coveted HR certification for HR professionals. The graduates from this program will be skilled in five strands that makes a difference to business: 1) leadership competencies including how to use leadership psychometrics, develop leadership competencies and coaching; 2) Use of analytics, evidence-based HR and managing technology; 3) Creating and changing culture for aligning the organization to strategy: 4) Designing, and changing organizational structure to meet strategy using contemporary organizational development (OD) techniques; and 5) Strong industrial relations and negotiation skills. Among the features of the programme are: First, the students will be groomed to develop leadership competences under the aegis of TAPMI’s Leadership Assessment and Development Center; Second, will develop high levels of empathy and corporate social responsibility through immersive project in the social sector; Three, they will be trained to become opinion leaders through a detailed research of contemporary HR topic which they will publish in an academic or industry related journal; Four, they will gain expertise in various areas of HR. Col. James, Area Chair HR at TAPMI said, “TAPMI is the first institution in India to collaborate with SHRM in designing the program and offering dual certification. Our objective is to create professionals in Strategic HR who can lead-manage transformational change in their business enterprise”. At the Press conference TAPMI also announced the commencement of its admissions process for the batch 2018-2020.